Brain herniation is a serious and often fatal problem that requires immediate medical care. 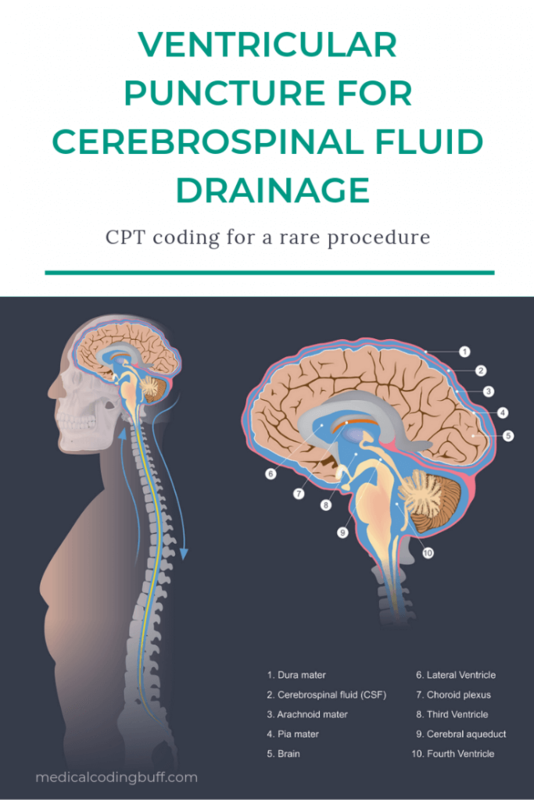 Therefore, when a patient presents with possible brain herniation, a surgeon may elect to perform a ventricular puncture to drain cerebrospinal fluid (CSF). Question: Patient is brought to the operating room with possible brain herniation. The surgeon performs a ventricular puncture through a previous burr hole without injection. A spinal needle is inserted through the skin and into the ventricle, and cerebrospinal fluid is drained. Assign the CPT code. CPT 61026 – Ventricular puncture through previous burr hole, fontanelle, suture, or implanted ventricular catheter/reservoir; with injection of medication or other substance for diagnosis or treatment. According to the SLUCare Physician Group, cerebrospinal fluid (CSF), or cerebral spinal fluid, is a clear liquid similar to the consistency of water. CSF protects the brain and spine from injury. A CSF test may be done to measure the pressure within the CSF and to determine certain neurologic disorders. These disorders may include infections, such as meningitis, and brain or spinal cord damage. A ventricular puncture is very rarely performed. However, it may be recommended for individuals with possible brain herniation. The procedure typically takes approximately 30 minutes. Hi googles. I’m glad you liked my article. I also apologize for the late response. I was having a little trouble with the tech end of things and found your post in my Spam folder, and we know it’s definitely not Spam. Thanks so much.